Recent comments on this blog about the former Woolworths in Church Street, Seaham have given me the nudge that I required, having taken some photos of the store back in April but not yet got round to writing about it. Just like the Woolworths in Benwell and Byker, the Seaham shop is one that had bitten the dust long before the company’s administration in 2008. Featuring the five bays and central pediment that characterises Woolies stores from the 1920s and 30s, Seamaster suggests that the store closed down in the mid-1980s – a period when there were quite a few store closures following the UK business’s split from its American parent. In its scale and grandeur, the former Woolworths is undoubtedly one of the finest shop buildings in Seaham. This makes it a particular shame that the present shopfront is so dismal, disconnected architecturally from the upper half of the building, and having complete disregard for the property’s symmetry. It’s a far cry from the 1970s, when old photographs suggest that the building’s original and harmonious shopfront was still in place. If its past as a Woolies is the building’s first story, then its second and more recent story relates to it being a branch of the clothing retailer Ethel Austin. 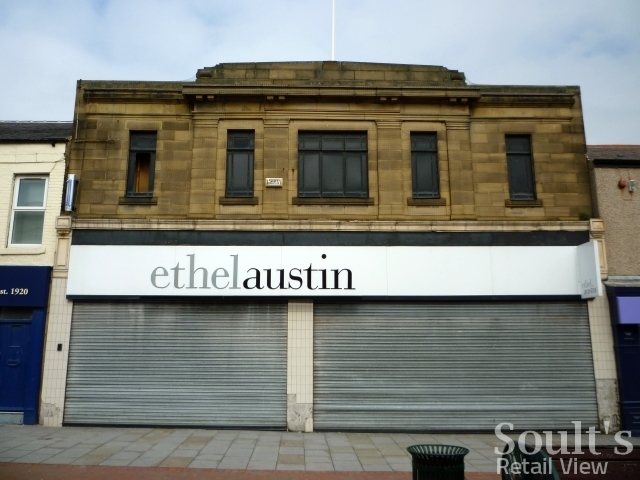 When I visited in April, however, the Ethel Austin store had itself closed down, one of the first 114 stores to be shuttered following the Liverpool-based firm’s collapse – yet again – into administration. 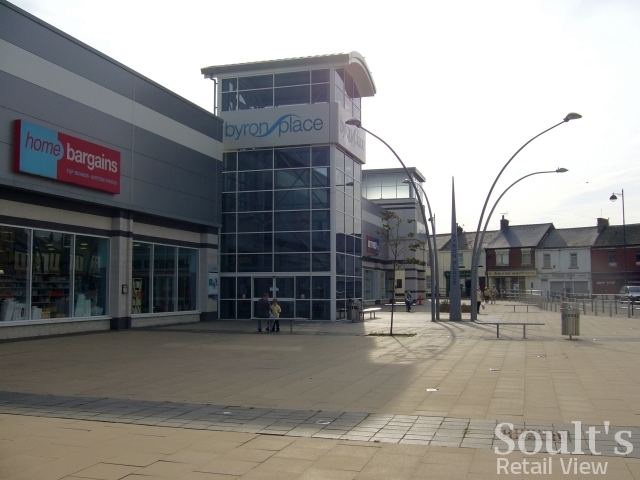 Though too late for Seaham, a rump of 90 stores were rescued in April, following their purchase by the firm’s previous owner, Elaine McPherson. However, the longstanding Ethel Austin brand looks set to disappear, with the stores remodelled into a new fashion and homewares chain called Life & Style, alongside the head office for the business moving from its historic base of Liverpool to Altrincham. Time will tell whether Life & Style can succeed where Ethel Austin could not – or whether, as one commentator has observed, it is “just Ethel Austin with a different name”. On balance though, it probably is the right decision – albeit a sad one – to ditch a 76-year-old brand that was starting to become so associated with failure. 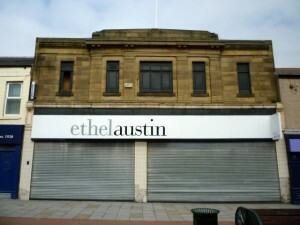 For now, however, the Ethel Austin name will no doubt live on in the fascias of closed-up stores such as the one in Seaham. With the appealing (and almost fully let) Byron Place mall having shifted Seaham’s retail centre of gravity to the bottom end of Church Street since its opening in 2007, the prospect of the town’s old Woolies securing a new tenant anytime soon does seem uncertain. 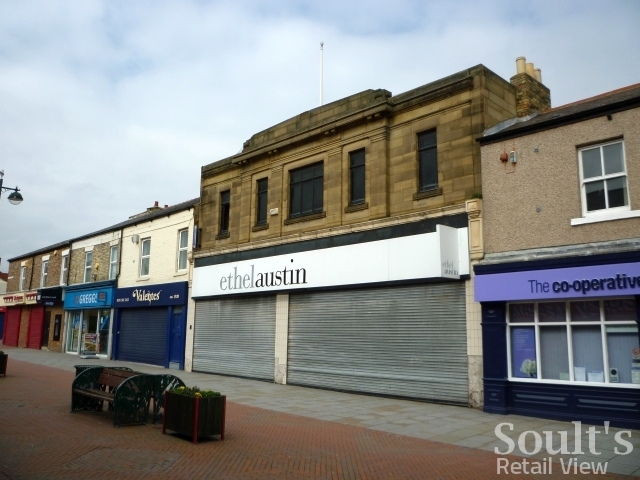 However, it would be a neat conclusion to the story if one of the successor chains to Woolworths – such as Alworths – were to bring a variety store offer back to Seaham’s old Woolies building after an absence of a quarter of a century. Indeed, with Alworths opening stores in Scotland later this month, there must now be a reasonable chance of seeing Alworths stores in the North East before too long. Whoever eventually moves in to Seaham’s former Woolworths, let’s hope that they also take the opportunity to do something about the dispiriting shopfront, allowing the property to once again be an object of beauty and pride on the high street. It’s ironic – Seaham’s recent rejuvenation (and, to a certain extent, gentrification) due to a massive influx of new homes should have invigorated Church Street, yet it seemed as doomed and desolate as ever the last time I was there. 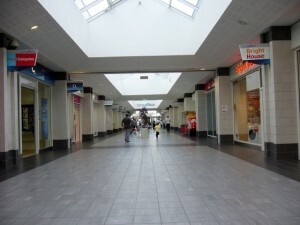 The Byron Place mini-mall does seem to have sucked what little life was left right out of it. I have very happy memories of growing up in the town, and spending my pocket money on cheap toys in that Woolies. Like many others, I bought my first records there. I can vaguely recall it closing down around the time the first sell-thru video cassettes went on sale, which would, as I earlier suggested, date its demise to the mid-eighties? I agree, what a lovely old building. Such a shame. Soult's Retail View » Rescued for the fourth time, can Ethel Austin really have a future?